As promised, here is my Roloxin review........... I was so excited try the Roloxin Lift Mask, a creamy white serum that dries into a tightening and lifting mask. However, the price for a box of 10 single serving packets of Roloxin was a about $110.00 per box! OUCH! So I searched around for a site that sold separate sample packets. I wanted to review Roloxin before spending that much money for the whole box. Fortunately, I found Roloxin samples on-line and bought 2 packets. As soon as my samples came in the mail, I was excited and immediately tried it! As the directions stated, I washed my face, opened up a packet and applied the creamy mask all over my DAMP face (including under the eyes) and on my neck and chest. I read somewhere that it's very important to apply this cream on damp skin. Then waited as it dried - which took about 10 minutes. It dried into a white, tight, film across my skin. Upon close examination, I did see a slight difference in the look and feel of my skin. As you can see I have natural freckles and the Roloxin mask seemed to make my skin tone lighter and more evenly toned....Almost like I was wearing a matte makeup foundation. Also, my pores seem smaller and less visible. All-in-all my skin looked and felt smoother to the point where I could go out without face makeup - if I used this mask on a daily basis. If you suffer from greasy or oily/shiny skin, the Roloxin Mask will also help reduce that look. It doesn't dry your skin out, but my skin felt less oily. What about a face lift and firm? 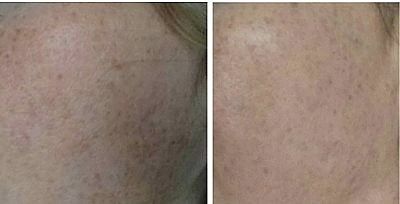 I can't say that I saw any noticeable difference in the firming or lifting of my face - especially around the eyes, jowls, or neck. But, then again, I've been doing facial exercises for a few months and saw incredible results - especially around the jowl and neck area. So maybe I'm not the best person to review Roloxin for it's lifting and firming qualities? Final review - would I use Roloxin again? Yes! If it wasn't so expensive, I would use Roloxin everyday. When I review a product, my decision on whether or not I like is also based on price. If a product is "nice" but super expensive, then i'ts not worth it to me. But, if it works the way I want it to - I'll do anything to get it. Like my favorite eye lift/firming serum. I've been buying and using this serum since 2012 and won't ever stop - unless I find something better. 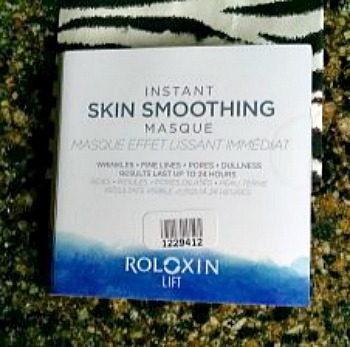 If I could buy Roloxin Lift Mask at my local Walgreens or Walmart for under $20 - YES, I would use it everyday. I like the way it makes my skin feel and I could go without any face makeup at all. I would especially like it during hot summer months as it gives the skin a smooth matte finish without that uncomfortable drying feeling. I hope this Roloxin review helped you decided whether or not to give this "miracle" mask a try. If you're interested in finding cheap (inexpensive) samples of Roloxin Lift Mask, visit e-Bay.